The biggest accomplishment of this week? Nora’s room is finally finished! You may have noticed when I unveiled her newly decorated bedroom that she didn’t have anything besides a sheet on her bed. I was having a really hard time deciding what get for her bed. Many toddler bedding sets have characters on them, which are not my thing, and I needed something that would go with her pink and white striped curtain. With the color palate fixed, a limited budget, and my finickiness about print and pattern, I was having a hard time finding something toddler bed sized that would fit. Until I remembered that I can sew…that it’s one of my goals to sew, in fact. Once I remembered that significant detail, I expanded my search to twin sized comforters and duvet covers…which eventually let me to this: Nothing says little girl like white with pink eyelets. I almost didn’t buy the duvet set, because all they had left was king sized — way more fabric than I would ever need — but I kept coming back to look at it, and the more I thought about how it was only $50 for two shams and a duvet so big that there’s plenty of fabric left for other sewing projects, the more I was sold. Oh Target, how I love you. The fabric is perfect, and there couldn’t have been an easier sewing project than a toddler sized duvet cover when the top with the buttons was already done for me. All I had to do was cut it out, sew three sides, and tuck her old crib comforter inside. 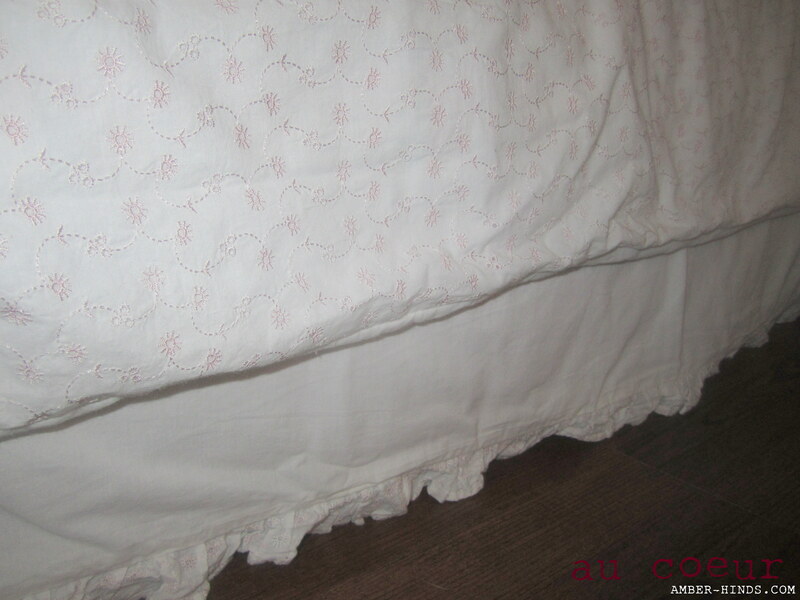 The bed skirt was from the edge of the duvet and only required sewing on two sides. I love it! A super simple project with big impact. 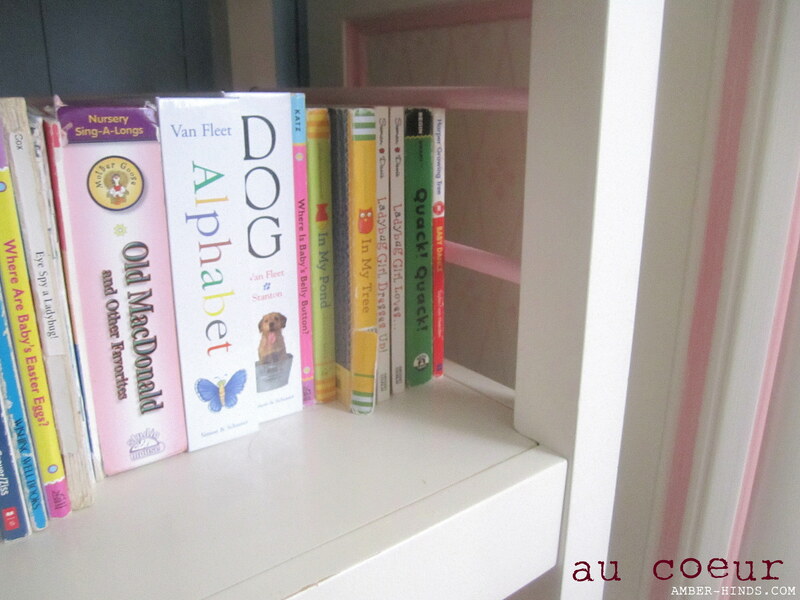 The other new addition to Nora’s room is her new “bookshelf”. 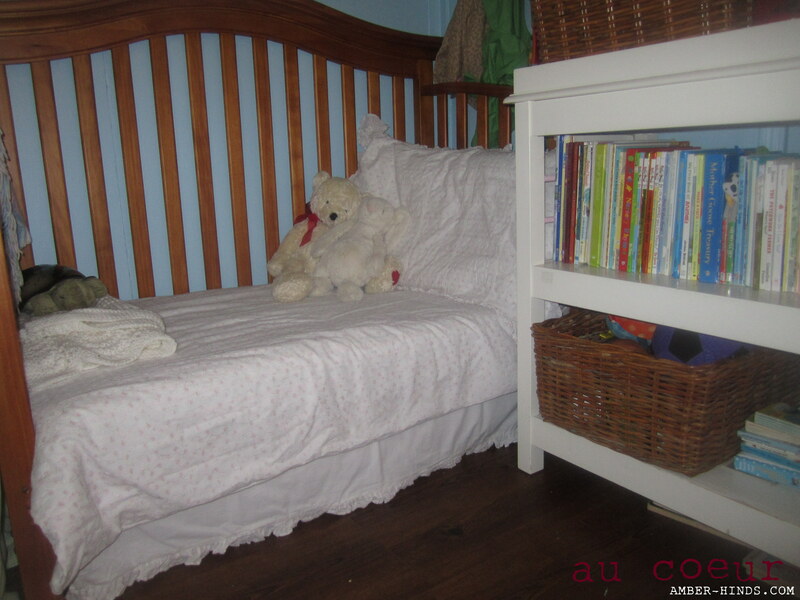 Can you tell that it’s really a changing table? It was Mr. T’s; I traded some babysitting for it so it was free (sort of). It’s a pretty sturdy piece of furniture from Pottery Barn and it came with four really nice baskets (two found a home in the living room). 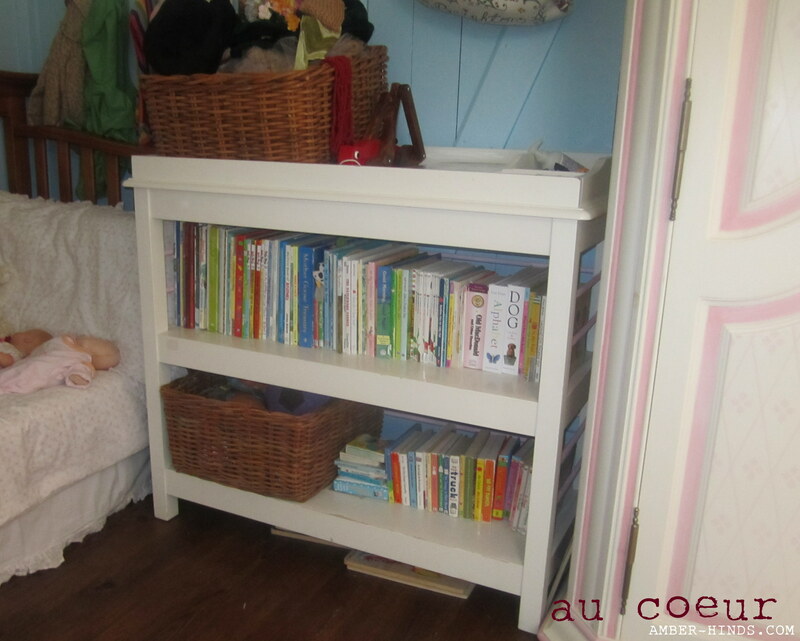 It replaced the smaller not-matching, assemble-it-yourself bookshelf that was in Nora’s room; not only did it give her more storage space,but it also matches her armoire and looks better. My favorite part, though, is the modification Tiago did for me. Yes, I really did modify a piece of Pottery Barn furniture. To make it function better as a bookshelf, we added two dowels to on the sides and back to keep the books in. Tiago drilled the holes and cut the wood for me just before they moved away. (What a great guy, right?) Then I spray painted them light pink to match the armoire. I was going to glue them in place, but ended up deciding to just let them rest in the holes — so if we ever use the changing table for its actual purpose with someone who isn’t a girl, it’ll be a cinch to take the dowels out and spray paint them a different color. I’m so pleased with these two additions to Nora’s room and how they tie everything together. Of course, I forgot to take a final picture of the entire room, so you’ll just have to trust me. And that’s why I’m not Young House Love.